Save the date for a spring walk in historic Franklin Park and learn about its history and continuing purpose as a public health solution to Boston’s urban challenges. This walk will include the gorgeous new Scarboro Pond Pathways and the area surrounding the current Shattuck Campus site. 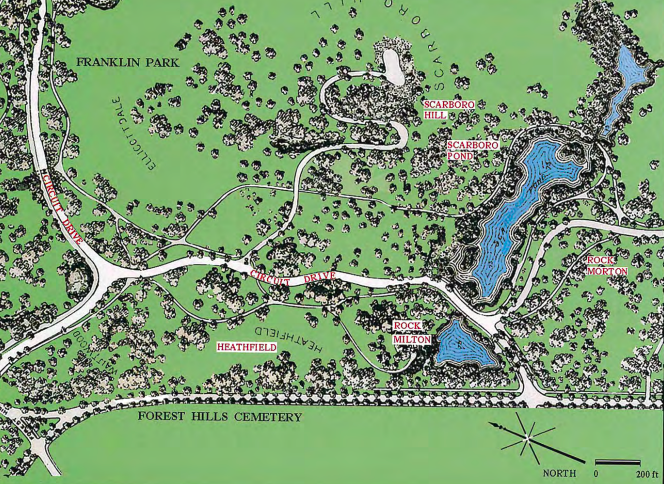 The park was designed by Frederick Law Olmsted, considered the father of American landscape architecture. The walk will be led by Mark Swartz, a former National Park Service Ranger at Frederick Law Olmsted National Historic Site, the one-time home, and office of America’s greatest urban park designer. In addition, an update on the status of the Shattuck Campus will be given by JoAnn Robinson, chair of the Emerald Necklace Conservancy’s Board of Overseers and a Landscape Historian. Currently, the Division of Capital Asset Management and Maintenance (DCAMM) is proposing redeveloping the land surrounding the Shattuck Hospital, as the hospital is moving downtown. This land was historically part of Franklin Park, called Heathfield. As park advocates, we are encouraging creative reuse of the space to restore significant open space instead of increasing development. The restoration of public open space is in keeping with Olmsted’s philosophy of parks contributing to public health. We hope to provide much-needed public health-focused recreation opportunities to our community. Learn more about the site and its history in person during the Parks for Public health walk. Snacks provided to start the walk. While RSVPs are not required, you can email RSVP@franklinparkcoalition.org to get updates and reminders of the event.